Giving a community growth opportunities. 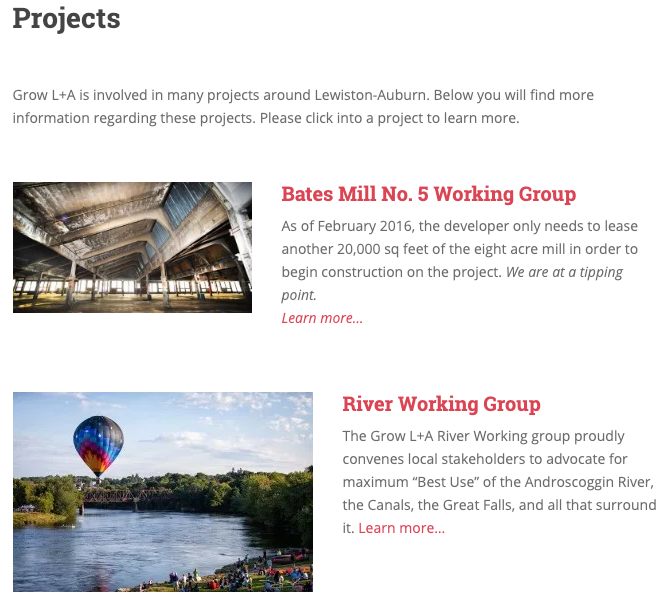 Grow L+A is a non-profit organization working in Lewiston-Auburn, Maine with the desire to see innovative, sustainable development in the twin cities, and the need to wisely use the cities’ existing historic infrastructure. Center to the group’s needs was ensuring an easy to use, easily updated, and engaging platform to share updates on going projects, and continually develop community excitement. Using a WordPress framework, the site was built out with multiple project pages, an active blog, and methods for getting the community involved in the work. Using multiple project pages, integrated calendars, and donor management tools, this site was built around the individualized needs of this group and community. The project pages allow community members to engage with the ongoing growth happening in their community.